Stranger Things is back for its second season, or, as the Duffer brothers think of it, a sequel to season one. A lot of viewers will want to jump straight to the most burning questions, and those questions are different for different people. 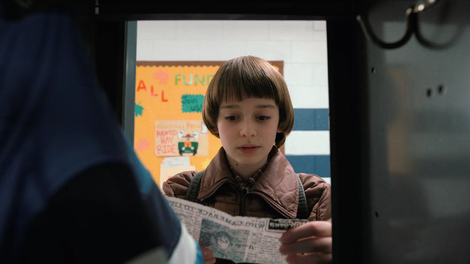 Has something been incubating in Will Byers since he was rescued from the Upside Down? What about Barb, what about Barb? Most poignant, most pressing: What happened to Eleven? “Madmax,” the second-season premiere, whets the audience’s appetite for these questions and serves up some new ones. Who is this predecessor of Eleven’s (Linnea Berthelsen) in Pittsburgh, with her heist crew, her Firestarter-style push, and her prominently placed tattoo reading “008”? How does Max (Sadie Sink), the swaggering newcomer who’s already beaten Dustin’s legendary Dig Dug high score, fit in with the old Hawkins Middle School A.V. club crew? Can Joyce and Will Byers trust Dr. Owens (Paul Reiser) and his new crew at Hawkins Lab? The inevitability of that reveal doesn’t make it less touching, but Hopper’s version of solo parenting is more spartan than sentimental. You can’t take a fugitive downtown for a haircut or run her over to Sears to buy a new coat. El sits around Hopper’s ramshackle cabin watching TV alone, wearing old flannel shirts, her grown-out crew cut scraggly. She survives on a diet of frozen waffles and TV dinners, often served late. Hopper’s protection keeps her warm and safe and fed, but it’s a far cry from the promise Mike made last season, a promise that was made to be broken, a promise of family dinners and school dances. A promise of moving on from her tortured past. There’s a lot in this episode that looks like moving on but isn’t. At the Hollands’ (Cynthia Barrett, Aaron Muñoz) home, the familiar grid pattern from season one is everywhere: their house’s windows and front door; the recurring patterns of tiles, shelves, and accessories in the bathroom; Mrs. Holland’s blouse. Even the repeated squares and rectangles in a display of framed photos of Barb from infancy to high school creates an irregular grid of sorts, echoing Mike’s D&D graph paper to suggest worlds beyond our own, both fantastical and perilous. It’s not just Will Byers who’s haunted by the Upside Down. The Hollands, who’ve never imagined such a place, who have no idea that’s where their daughter disappeared to, see hints of it at every turn in their home. Barb’s parents are selling their house, not to move away from a town full of sad memories and pity, but to finance the ongoing search for Barb. Brett Gelman brings an off-kilter intensity to Murray Bauman, former investigative journalist and the Hollands’ hired investigator, that underlines just how preposterous he sounds. Hopper, who knows that the truth is far stranger, scoffs at the half-truths Bauman unearths of an absurd-sounding Russian weapon in the form of a bald little girl with “psionic ability.” Bauman might be as good at his job as the Hollands hope. If he’s even half that good, they won’t be moving on for a long, long time. Joyce Byers can’t move on, and can’t let go of the panic and grief that gripped her while Will was in the Upside Down. Every time she drops him off, she gives him excruciatingly clear instructions on exactly when she’ll pick him up. (“And don’t walk or bike home,” he repeats back to her, clearly having heard it a thousand times.) When the phone rings, she winces, and it’s hard to know whether she’s reminded of those eerie calls from the other side, or remembering phone calls bearing bad news, or just cringing at the thought of another prank call. 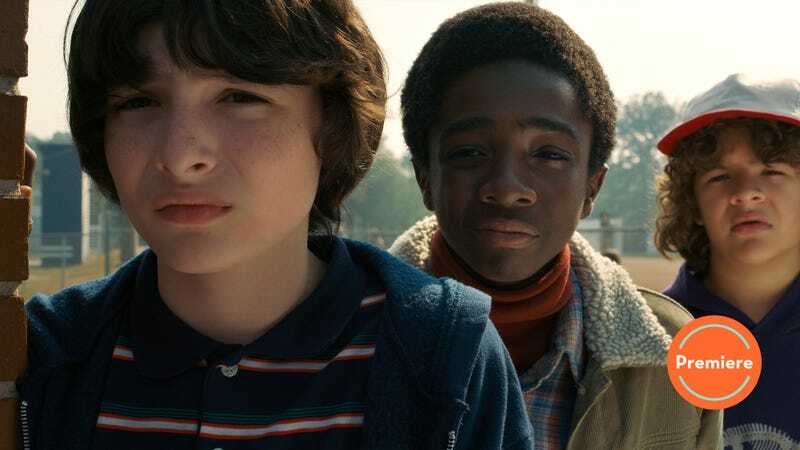 It’s Will Byers who’s most mired in the trauma of the past year, and not only because he’s the one who was most immersed in it back then. The Upside Down is still with him, through any door and around any corner, haunting him with horrors looming over the horizon… and, the last glimpse of him from season one suggests, maybe growing inside him. As he did in the first season, Noah Schnapp conveys Will’s terror and resilience with his eyes, his posture, his quiet face. The good news: Will is telling people about his “episodes,” not hiding them. Whatever came back with him, Will still seems to be Will. The bad news: Will is tormented, and that torment is monitored and treated by the new staff of their old enemy, Hawkins Lab, led by Dr. Owens. As Dr. Owens, Reiser walks a tricky line. Greeting Will as he comes in for a session (what would probably be called “debriefing” by the soldiers and cops Owens and Hopper keep comparing him to), Owens is friendly and easy-going. But under his breezy chatter about Halloween candy, he’s anchored by a quiet earnestness. If anyone in that hulking bureaucracy could earn Joyce’s grudging trust, maybe it’s this guy, who (as Hopper points out) has every degree imaginable to go with his bedside manner. It’s an inspired piece of casting. Stranger Things gets to exploit Reiser’s comic ease and familiarity, even as it exploits his role as stealth baddy from an ’80s genre classic. Is Dr. Owens the white-hat, white-coat good guy he’d like Joyce and Hopper to believe? Or is he the amiable face of a soulless agency that will bleed Will and his family dry in pursuit of a monstrous goal? This knife edge of trust and mistrust is so crucial to the character that before naming Dr. Owens, the Duffer brothers referred to the character as “Paul Reiser.” But Joyce doesn’t have to be genre-savvy to suspect something’s a little off about the insistently trustworthy doctor. If only he didn’t keep quietly reminding Joyce that she can trust him, maybe she’d trust him a little bit more. Something about Stranger Things bypasses all my cool analysis, making me forgive, if not forget, the show’s missteps. (After witnessing the season-one ferocity of El, Nancy, and Joyce, the boys should know better than to be surprised at a girl who’s also a badass.) The cold open of “Madmax” had me laughing out loud; by the episode’s end, when Hopper and El sit down for dinner in the warm glow of a single lamp, I was clapping for joy. Even the second time through, I got a little teary-eyed. This season promises big questions, big answers, and a big, big monster, and if the Duffer brothers (who wrote and directed the season premiere) want to take their time moving on, that’s fine. We can wait for our dessert. Welcome to daily coverage of Stranger Things season two! I’ll be writing these reviews as I watch each episode, and I’ll ask those of you who jump ahead to remember to tag spoilers from future episodes in the comments. For bingers, Erik Adams is writing capsule reviews, updating regularly. A member of 008’s crew calls her “Kali,” but chatter around the series promises a different name. I’ll call her by that name when the show does. Dr. Owens greets Joyce and Hopper as “Mom, Pop.” Neither corrects him, which doesn’t bode well for Joyce’s new boyfriend, Bob (Sean Astin). Neither does his enthusiastic “I love Kenny Rogers!” which sides him firmly with the “normal” people in Jonathan Byers’ binary analysis of the world. But before Bob The Brain (as Hopper calls him) exits the Byers’ lives, surely his “electronics stuff” will pay off… and probably so will some deep-cut Goonies references. Even in an episode about failing to move on, I still can’t believe Mrs. Wheeler hasn’t dumped her turncoat toady of a husband yet.